I've heard many times that Canadians are very polite. For the most part, I would agree. When I was in Canmore a week ago I saw this bit of graffiti. I think it's a shame when surfaces are defaced, but at least this person was polite about it and for that reason I chose it as eye candy. 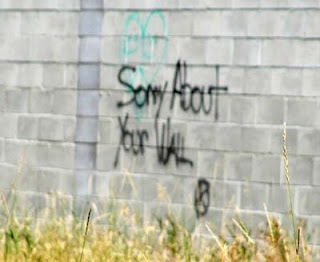 A polite graffiti writer is something you don't often see. The picture is a little blurry and I snapped it quickly as I was driving by. Distracted driving, I know. Bad Joanne. I'll be good from now on! In Regina, like 15 years ago, there was a politically correct graffito. I remember 'Parents Love Your Gay Children' and 'Vote' in particular... Not as funny as this guy, though. What? No Profanity. No wonder the Canadian $$ is strong, the people polite and the country clean..Losers!!!! You sound a wee bit jealous! !